Investing in shade sails is certainly a good idea, regardless of what application you have in mind. Shade sails are flexible and versatile, and they can be used to provide shade to any outdoor area. Moreover, they are also a cost-effective shade solution, and they’re easy to install. However, before you buy shade sails off-the-shelf, take a second to consider shade sails made to order. Today, we’ll take a look at some of the benefits that custom shade sails will offer you. Premade shade sails are available only in select sizes and shapes. This makes it difficult to find pre-made shade sails that will perfectly fit your needs. However, you will not face this problem if you get shade sails made to order. Shade sails made to order, such as those we manufacture at Global Shade can be designed to suit any application. 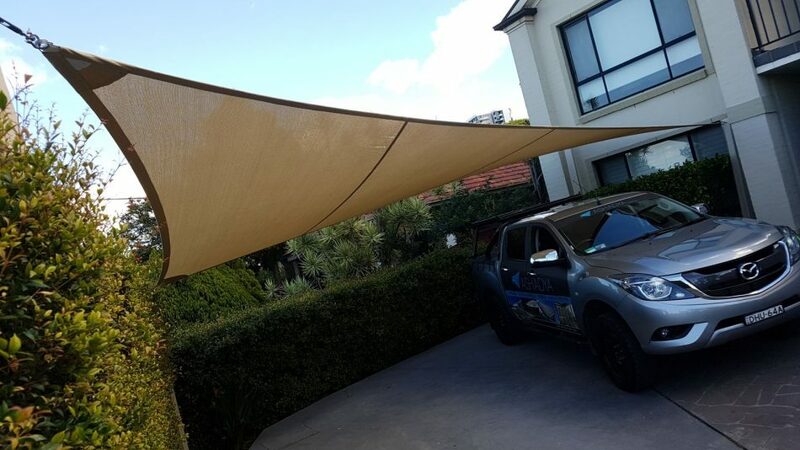 Whether you’re a homeowner looking to shade your outdoor entertainment area, car park or pool, or you’re a business owner looking to provide carpark shade or shade your outdoor seating area, we can custom design a shade sail to meet your exact needs – no matter the shape or size. The premade shade sails that you’ll find your local home improvement warehouse are off-the-shelf products and are often manufactured from standard shade cloth fabrics. While these shade sails may provide adequate shade for your needs, they will not provide the highest UV protection. Moreover, they probably won’t offer great longevity. On the other hand, with shade sails made to order, you will get a quality product that has been manufactured using your choice of top grade shade fabrics. Custom shade sails offer excellent UV protection and may last much longer than a pre-made shade sails made from standard shade cloth fabrics. Here, at Global Shade, we offer you a choice of 6 industry-leading shade cloth fabrics with our custom shade sails. In case you’re looking for a waterproof shade solution, we even have three waterproof shade cloth fabrics for you to choose. The shade cloth fabrics we use to manufacture our shade sails are backed by extensive warranties as well. With pre-made shade sails, you have very limited options when it comes to the design and colour of your shade sail. However, if you choose to go with shade sails made to order, you will have a range of colour and options at your disposal. By getting shade sails made to order, you can match or contrast the colour of the shade sail with your landscaping. At Global Shade, our custom shade sails are available in a range of designer colour options for you to choose from, depending on the shade cloth fabric that you choose. We can customise our sails to meet your design requirements, and we can even include your branding colours. There are several benefits to getting shade sails made to order. Premade shade sails come in select sizes and shapes, and they are not suitable for every application. However, custom shade sails can be custom designed to suit any application. While pre-made shade sails are made using standard shade fabrics, custom shade sails are manufactured using industry-leading shade cloth fabrics. You can also choose the colour and design of custom shade sails to suit your preferences. Moreover, for the best quality custom shade sails in Australia, look no further than the shade experts at Global Shade. To discuss your custom shade sail requirements with one of our experts, call us today!